Flora Lamson Hewlett (1914-1977), born and raised in Berkeley, was a member of a long-time California family. She received her bachelor’s degree in biochemistry from the University of California in 1935. 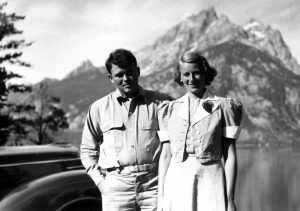 She married William R. Hewlett in 1939, and the couple raised five children. When in 1966 she joined her husband and their eldest son in establishing the Hewlett Foundation, she brought to their joint enterprise discerning intelligence, an openness to new ideas, a quiet tenacity of purpose, and a disciplined desire to work and to learn. Many institutions in the San Francisco Bay Area sought her services as a board member. Her thorough preparation and considered judgment made her a valued member of every board on which she served. Flora Hewlett was never happier than when she returned with family and old friends to the Sierra Nevada of her girlhood summers, and she worked to preserve the mountains’ beauty and majesty for people she would never know. A proud alumna of the University of California, she helped make first-rate education available to students who would otherwise have missed the opportunity she treasured. Most comfortable with traditional religious practice, she nevertheless joined her church’s work with its counterparts in the neighboring African American community and supported many forward thinking ventures in the service of her long-held values. She knew how to make a commitment, and having made one, she bore its consequences with steadfastness, imagination and gallantry. In the words of George Wilson, her pastor and friend, the life of Flora Hewlett exemplified both common and uncommon grace. In addition to close engagement with her family, Flora devoted much of her time and energies to public service. Her main philanthropic activities centered on the Hewlett Foundation, of which she was a co-founder with her husband. She was a member of the Board of Trustees of Stanford University; a Trustee of the San Francisco Theological Seminary; and an elder of the First Presbyterian Church in Palo Alto. The Flora Lamson Hewlett Library at the Graduate Theological Union in Berkeley was named in her honor. She also served on the Executive Committee of the World Affairs Council of Northern California and as a director of California Tomorrow, a statewide environmental group.